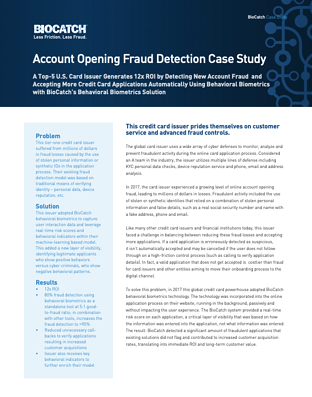 This tier-one credit card issuer suffered from millions of dollars in fraud losses caused by the use of stolen personal information or synthetic IDs in the application process. Their existing fraud detection model was based on traditional means of verifying identity – personal data, device reputation, etc. This issuer adopted BioCatch behavioral biometrics to capture user interaction data and leverage real-time risk scores and behavioral indicators within their machine-learning based model. This added a new layer of visibility, identifying legitimate applicants who show positive behaviors versus cyber criminals, who show negative behavioral patterns.